The Associated Press did a useful fact check of Trump’s bizarre assertions on climate change in the interview with his friend Piers Morgan. Since Trump is not good with reading books and the like, it may be helpful to reply to his falsehoods with graphs. Actually, no. 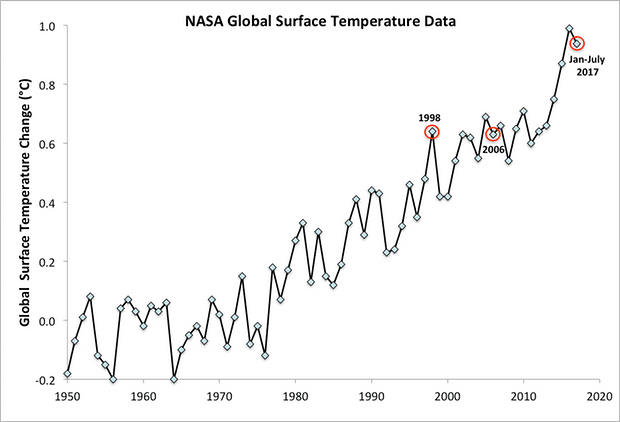 The average earth surface temperature has been going up steadily and indeed faster than most climate scientists predicted. That is an average surface temperature increase. You have to keep in mind that it includes the oceans, which are cold, and the declining ice-covered parts of the world. So an increase of a degree Centigrade is much more alarming than it sounds. In any particular place, like Phoenix, AZ, the change could translate into a 10 degrees F. increase. Then planes couldn’t take off and people would be stuck in doors in air conditioning all the time. The National Snow and Ice Data Center begs to differ. Trump spoke of “ice caps,” but the Arctic and the Antarctic are very different systems. The north pole, what with being an ice cap on the ocean surrounded by land, is less complicated than Antarctica, which is a land mass covered by ice and surrounded by ocean. Most scientists did not predict that the Arctic ice cap would be “gone by now.” They do think it will be gone in a matter of decades. As can be seen from the NSIDC map, ice at the Arctic is not “at a record level.” The ice fluctuates month to month and year to year but the long term secular trend is obviously steeply downward. This declining northern ice cover is a direct result of humans farting greenhouse, heat-trapping gases such as carbon dioxide into the atmosphere at the rate of 41 billion metric tons a year! They belch out this nasty, toxic gas by burning coal and gas for heating and gasoline and diesel for transportation. In 2016, global sea ice declined so much that we lost a chunk of ice as big as the country of Mexico! As for Antarctica, it is a land mass with an ice cover. 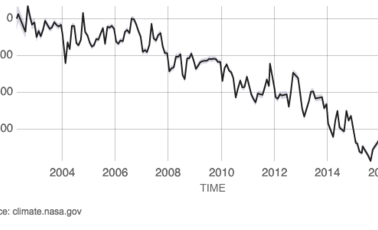 Its land ice sheets have been losing mass in this century at a worrisome rate. It is true that the small ring of Antarctic sea ice was growing slightly in extent in recent decades, but even it suffered a reversal last year. 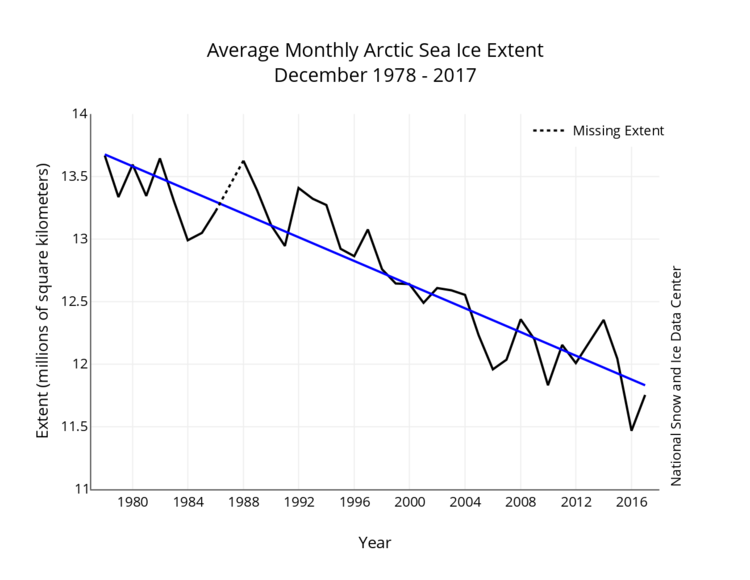 So it too is not at a “record level.” Since Antarctica is a land mass, its thin ring of sea ice isn’t what is significant (unlike in the case of the North Pole or Arctic, which is all sea ice). Antarctica’s sea ice can grow even if the gargantuan ice cover of the continent as a whole is melting. In fact, when Antarctic ice over land melts and flows into the sea, it adds fresh water to salt water, making it easier for the ocean to freeze. Changes in the ozone layer could also be shifting wind patterns that contribute to a freezing of coastal water. There are also complex relationships between Antarctic weather patterns and the South Pacific. Anyway, the paid-for denialists that Trump has been listening to have deliberately buried the lede. The story isn’t a little bit of extra sea ice around the continent of Antarctica. The story is the melting of the Antarctic ice pack. And that is not in doubt, any more than the melting of the Greenland ice pack. It includes enormous glaciers that are held back by ice shelves that extend over the ocean. If the ice shelves plop in, that won’t matter much–they are already in the water and so won’t increase sea level if they fall in. But if they release the glaciers, and the glaciers fall into the ocean, that will matter quite a lot. One of those glaciers is so enormous that it could raise sea level several yards/ meters all by itself, in which case say bye bye to Mar-a-lago and Miami and New Orleans and Calcutta, etc.